LUNA is a gripping thriller about five corporate families caught in a bitter battle for supremacy in the harsh environment of the moon. It's very easy to die on the moon, but with its vast mineral wealth it's also easy to make your fortune. 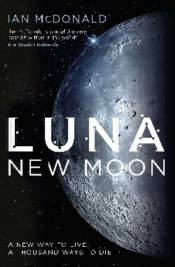 Following the fortunes of a handful of disparate characters, from one of the lowliest workers on the moon to the heads of one of the most powerful families, LUNA provides a vast mosaic of life on this airless and terrifying new home for humanity.